It seems to be happening more frequently these days, but there's a new 911 on the horizon. It was launched tonight in Los Angeles at PECLA ahead of its display at the LA Auto Show tomorrow. Porsche says the new car has an exterior that "unmistakably reflects the Porsche design DNA" which is a fun way to say that it looks pretty similar to the outgoing car. 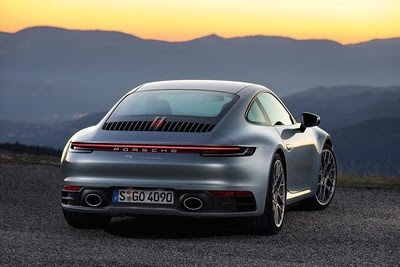 The eighth generation 911 features an updated version of the current model's turbocharged flat-six with a bit more power, as well as a new 8-speed PDK (and optional 7-speed manual), a more luxuriously appointed interior, and a whole scad of new tech. If you liked the 991.2, which a lot of people did, this is bringing you more of the same, except more. For now, just the Carrera S and Carrera 4S are here. More models are surely coming soon. Porsche has not released much in the way of information on the new car, as we don't know the displacement of the new engine, or how much torque it produces. We do know, however, that with more efficient turbos, larger intercoolers, and a new fuel injection system, the 911 Carrera S and Carrera 4S produce an extra 23 horsepower compared to the current model. That's a total of 443 horses under the rear lid. The Carrera S can hit sixty in 3.5 seconds, but a Carrera 4S with Sport Chrono option can make the same sprint in as little as 3.2. That's crazy! The first 901s took 9.1 seconds! The manual transmission will be available at a later date, but from launch the new 911 will be fitted with a brand new 8-speed PDK. We don't know much about it, but it's got an extra gear so it's gotta be better. The new car's body is much wider than the outgoing model, as well. The front body width is stretched 1.77 inches, while the rear has been bulged out an extra 1.4 inches. That gives the Carrera and Carrera 4S the same wide stance. In order to reduce weight, that bodywork is now constructed completely of aluminum. The new body is interesting, to say the least, and I'm sure it will grow on me, but there are a few strange pieces of design that don't jibe. The rear center high mount stop light looks out of place, as does the multi-font rear badging. Porsche's new interior design, first pioneered in the Panamera then trickling through the Cayenne, has finally reached the 911. Thankfully the tachometer is still in the center, now flanked by a pair of huge screens that function as the car's other gauges. A third giant screen sticks up in the center of the dash. Under the center console PCM is a clicky-looking set of metal toggles. Perhaps the biggest change of all, however, is the addition of a cup holder in the center console. It's not a flimsy flip out thing, it's an actual substantial cup holder. Porsche has added Wet Mode to all 911s, which detects the presence of water on the road and changes the car's character to adapt. Collision avoidance systems have been added, including night vision assist and camera-based brake assist systems. Adaptive Cruise is available as an option, which includes stop and go functionality. Sorry but I think the rear angle pictures of the Panamera were mixed in with the 911. Check your edits.